Next time you’re in a restaurant look around… diners are using their phones to upload pictures and stories about the places they visit and the foods they eat. Sometimes the tales about the restaurants and servers are true, but often times, it’s just a bunch of hot air and the servers take the brunt of unwarranted criticism. 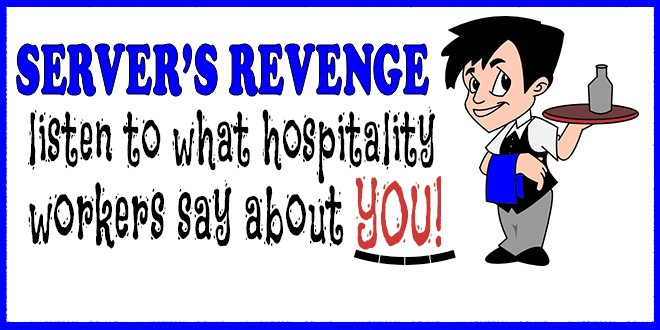 That’s why we created “Servers’ Revenge” as an opportunity for service industry workers to say what they REALLY think about their guests. This week on “Servers’ Revenge,” the story of what happened when a female restaurant guest gets over-served too much alcohol. If you work in the service industry and have a story to share or want to back to the guests who make you mad, just click the red EMAIL link on the right side of the page. We’ll digitize your words to protect your identify. Previous Guest: Steve Druker – Are GMOs On The Market Illegally?